When delivering food, time is always of the essence. When food items fall into the temperature danger zone, you risk the rapid growth of harmful bacteria. The danger zone falls between the range of 4°C (40°F) and 60°C (140°F) - because of this, it’s important to ensure that food is properly stored for delivery and not left to sit for longer than absolutely necessary. Using equipment like insulated delivery packaging can help to avoid food falling into this dangerous range, and will keep your customers safe and satisfied. When transporting takeout meals to their destination, it’s extremely easy to forget that foods of varying temperatures should be separated. It’s important for delivery staff who are packing up and transporting takeout orders to remember that hot and cold foods need to be kept away from each other. Ideally, both hot and cold food items will be kept in separate packaging and delivery bags. Not only will it make for an unappetizing experience for customers, but hot and cold food items kept in close proximity throughout a lengthy delivery will drastically increase the chances of foods entering the “danger zone”, which will allow dangerous bacteria to grow rapidly. 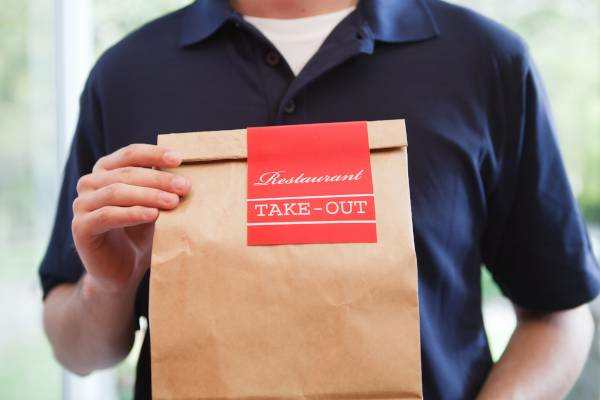 Not all food service establishments are created equal, which means the packaging for takeout food can vary wildly depending on the restaurant. Many organizations try to cut costs when it comes to delivery packaging, leading to food reaching dangerous temperatures, spills, and a generally underwhelming experience for customers. It’s important that establishments have appropriate takeaway packaging for all meal types, including different packaging for hot and cold temperatures to maintain consistent temperatures. It is also important to have appropriate packaging for unique items like soups, salads and fried foods, all of which should be enclosed in specialty delivery packaging. Offering delivery and takeout services at your food service establishment can be a great opportunity for growth and increased profit, but it can also bring with it a great deal of new business, which can lead to workers becoming overwhelmed and not upholding your businesses food safety guidelines. On top of this, often delivery staff are untrained in the areas of food safety or aren’t closely monitored for food safety compliance. Online food safety training for all staff members will help your workers recognize and uphold food safety best practices, and will help them to avoid mistakes even in the busiest working conditions and most stressful delivery routes. Having vibrant visual reminders like food safety infographics posted around your establishment will also help to remind staff of food safety guidelines, and serve as a gentle reminder of safe practices during peak service times and during stressful rushes.